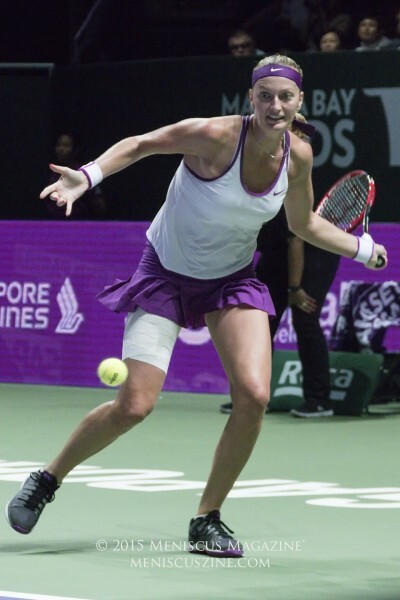 A day after her emotional semifinal victory against Garbiñe Muguruza, Agnieszka Radwanska found herself in tears again after unexpectedly winning the 2015 WTA Finals in Singapore, defeating Petra Kvitova, 6-2, 4-6, 6-3. Her press conference transcript, provided below in full, is courtesy of FastScripts by ASAP Sports. How does it feel to have this trophy after the year that you’ve had? AGNIESZKA RADWANSKA: Yes, well, unbelievable. I didn’t really expect this at all, especially the beginning of the year it was not great. I think the good sentence is to do it here: Doesn’t matter how you start, matters how you end. I think this is it. Definitely I think just no words to say what I was feeling on the court. Definitely I didn’t expect it at all. Before Singapore you hadn’t beaten a top 5 player this year. Now you’ve beaten three in like four days. Not bad. So talk about your level this year. Do you think your 1‑2 record in the group was maybe deceiving, that it was not indicating how well you were maybe playing? AGNIESZKA RADWANSKA: I was saying also before, I lost first two matches, but it’s not like I was playing bad. It was still good matches. I just didn’t use the chances. I wasn’t really focus enough and something just slip away and then it was hard to come back. But definitely not bad matches, especially the one against Maria. That’s why I didn’t ‑‑ I just knew being fresh and have a good rest, that is very important for us. I don’t know how, but I was really feeling better afterwards, and I think I used to conditions, used to surface. I think I was playing even better in those two days. She managed to win the second set and got an early break in the third. What was your mentality like and what do you do to stop her comeback? 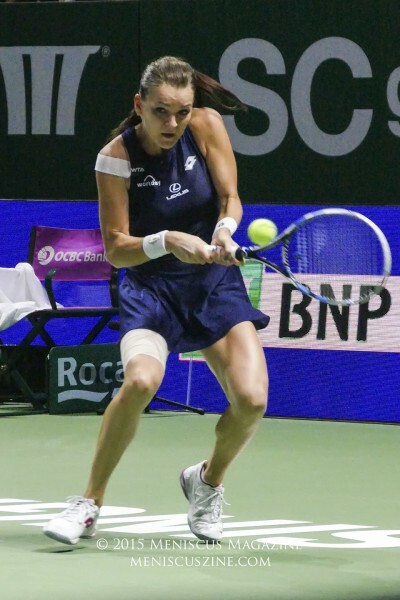 AGNIESZKA RADWANSKA: Well, I think in that match was a lot of the breaks. In the second, in the third set, and I was also up in that second set, I just lost my serve pretty quickly. So I think the serve of not really the biggest key in that match. You could just turn around on every score. Just one break in the third set, but otherwise pretty much tight match from the beginning until the end. We saw you cry on the court after both the semifinal and final tonight. You’ve won a big title like Miami and been in a Wimbledon final. Why was this so emotional for you? 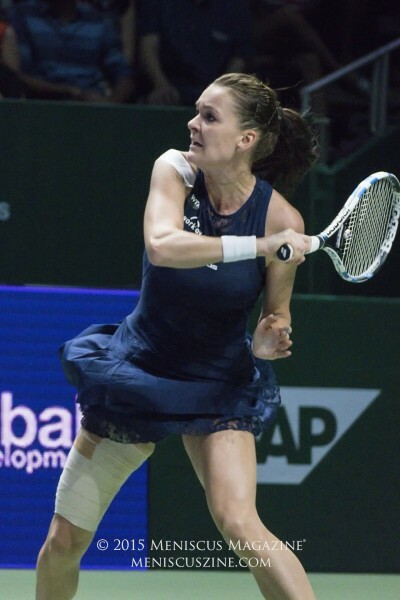 AGNIESZKA RADWANSKA: Well, definitely different tournament than any others. I think maybe because I didn’t really expect it at all. First of all, to be here; secondly, that I went to the semis maybe with a little bit of luck as well. And then playing this incredible semifinal match against Garbine. And then the final and winning the trophy. That’s something I didn’t even imagine. Maybe that’s why, yeah. If I could ask now that we’re quite a few months away from it, maybe you can reflect a little bit, why do you think that for you the Martina Navratilova partnership ‑‑ I know she was part time ‑‑ didn’t quite work out? AGNIESZKA RADWANSKA: Well, I think that was a little bit bad timing as well. I didn’t really feel good in the beginning of the season and it was tight schedule for me and for her. We suddenly decided together that it’s not really going to work for both of us. Yeah, we just stopped. That’s it. Did you get anything out of it? AGNIESZKA RADWANSKA: Of course. I mean, being around Martina is a huge honor, especially with the huge experience she has on court. She gave my a lot of advice on and off the court. Still couple of good months. You played an exhibition here in 2011. Can you think back on that and compare the atmosphere then with the crowds and atmosphere we’ve had here in the last two years? AGNIESZKA RADWANSKA: Well, I think you can’t really compare that. This year it was unbelievable. I think the crowd is so good. I think they’re cheering for every player, and you can see that they really enjoy tennis here. They love tennis. You really enjoying also playing against those kind of crowd. I can also hear a lot of Polish voices and Polish flags. Great crowd. 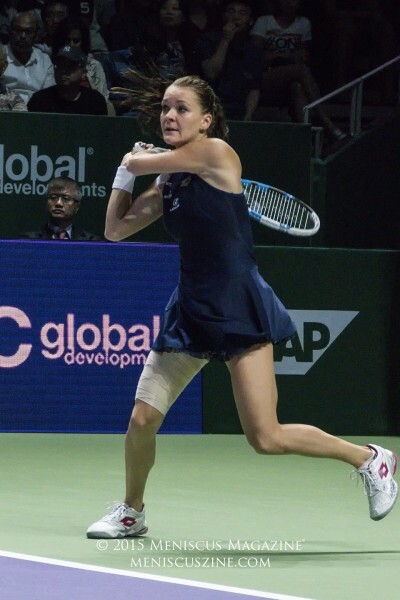 Before you, the last WTA Finals champion who had not won a Grand Slam was Mauresmo. She did it in ’05, and the next year she won two slams. How do you think this title can perhaps boost your confidence or help your chances of winning slam? AGNIESZKA RADWANSKA: Well, for sure give me more confidence, especially that in a Grand Slam you also to have win and beat couple of top players in a row. The trophy is great, big. The tournament very important. Most important in your life. $2 million. Also that is not so bad. AGNIESZKA RADWANSKA: Yeah, not bad. What are you going to do with that? Have you ever thought about? I mean, more than few beers. AGNIESZKA RADWANSKA: Well, to be honest, I didn’t really think about it yet. But definitely really nice check that I’m going to have. Well, I think for sure I’m going to celebrate tonight with my team who are of course I think even more tired than I do watching all my drama matches. But then I think I deserve for some shopping as well, so I definitely do that. And the rest I think just keep for myself, and then I’m going to think what I do with the rest. I heard this from one of my media friends in China. He said Andy Murray delayed his press conference in Paris because he wanted to watch your match. What’s your comments about this? Do you sometimes watch Andy Murray’s match? 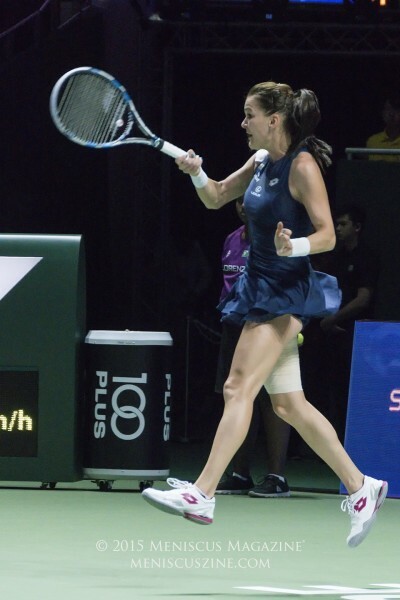 AGNIESZKA RADWANSKA: Andy Murray? Of course. Who do you think of this? AGNIESZKA RADWANSKA: Well, actually, he chose bad timing actually. Paris was not great. But I appreciate that some of the players like Andy watching my matches, of course. Actually, I love his tennis. I think he’s incredible player. Of course I love watching him playing as well. Pretty much every match that I can watch and is on TV, always. And of course now I think in London as well. Just during this year, third set struggling, struggling, struggling. The last couple days in the third set, no nerves at all for the first time in a long time. Why? Why did that happen? 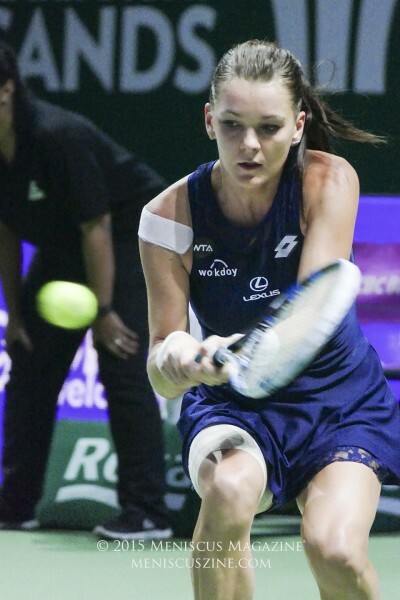 AGNIESZKA RADWANSKA: Well, about today? Why it became positive in the last couple days. AGNIESZKA RADWANSKA: Well, that set was really kind of up and down as well, a lot of breaks as well, couple of long games. So pretty much the serve was not really the key, as I was saying before. You just fight until the end. I think I wasn’t really nervous because I think was trying to think I have really nothing to lose. I did already a great job to be in the final. Of course maybe in the last point then you always kind of shaky, but I think I was just playing my best tennis until the end. Always I think whole match was on the same level. Not really up and downs from my side and always keeping the same, consistent level, and I think I that’s why. So the players call you La Profesora. Everybody comes in here and says you’re one of the smartest players in the game; Andy Murray delays press conferences to watch your matches. What’s your reaction to kind of that sort of reputation that you’ve built or yourself, especially with respect to somebody who hasn’t won a major, hasn’t been No. 1? Seems like there is a lot of respect there. AGNIESZKA RADWANSKA: Yeah, well, I think this is always great to hear, especially from those kind of players like Andy Murray or the other girls. Well, like you were saying, I think this is a big respect, so I just have to appreciate it. It’s always very nice compliments when I can hear that my tennis is smart or very entertaining. Each time I’m very happy to hear that, like I’m hearing for the first time. The second set you made no unforced errors. You still lost that set. Down 2‑Love in the third, what went through your mind? How do you get back in the game? AGNIESZKA RADWANSKA: Well, I think Petra was playing a little bit better after that first set. In the first set she make couple of easy mistakes, and I think then she really played aggressive tennis, very deep balls that I was pretty much running just behind the Singapore sign. She was just playing her best game and I couldn’t do much. Why you laughing? It was true. (Laughter.) I think she start to play much more aggressive and everything was working her way. And then I was able to catch up a little bit in the third set and end up like that. In that second set when Petra won those eight straight points to break and hold, we know what she can do, what that’s she’s capable of. When you’re in that situation, is there a sense of you, uh‑oh, here come Petra, and how do you reel back into it? 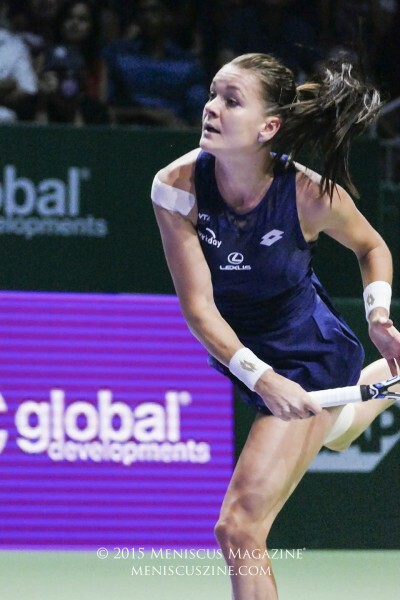 AGNIESZKA RADWANSKA: Yeah, like I was saying, I also know what she can do on court and how powerful is her tennis and how big is her serve as well. She’s using the lefty serve very good, I think the best on the tour, and that’s very dangerous. I think I everything was coming huge and I couldn’t do much. That’s why end up the set like that. I couldn’t do anything.